Plant Flow Measurement and Control Handbook is a comprehensive reference source for practicing engineers in the field of instrumentation and controls. It covers many practical topics, such as installation, maintenance and potential issues, giving an overview of available techniques, along with recommendations for application. In addition, it covers available flow sensors, such as automation and control. 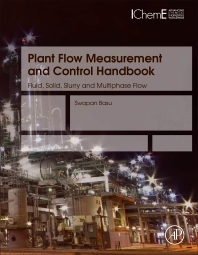 The author brings his 35 years of experience in working in instrumentation and control within the industry to this title with a focus on fluid flow measurement, its importance in plant design and the appropriate control of processes. The book provides a good balance between practical issues and theory and is fully supported with industry case studies and a high level of illustrations to assist learning. It is unique in its coverage of multiphase flow, solid flow, process connection to the plant, flow computation and control. Readers will not only further understand design, but they will also further comprehend integration tactics that can be applied to the plant through a step-by-step design process that goes from installation to operation. 8 Other miscellaneous Flow measuring techniques.